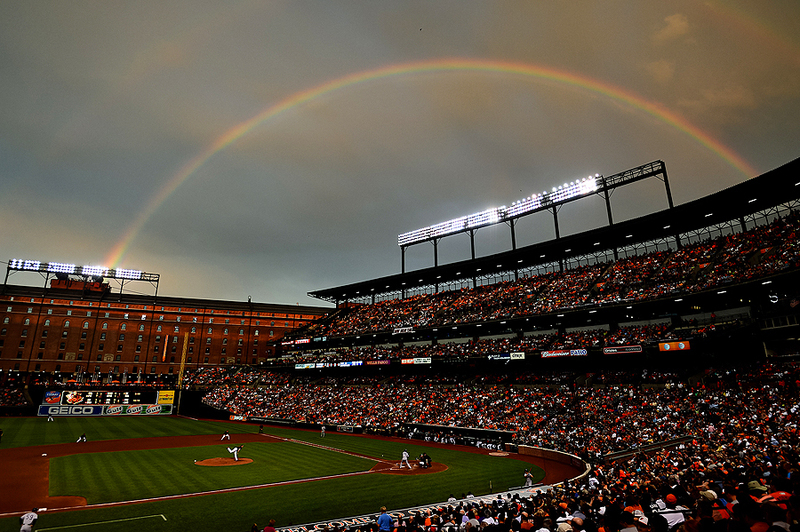 "A rainbow shines in the sky as pitcher Kevin Gausman #37 of the Baltimore Orioles works batter Alberto Gonzalez #40 of the New York Yankees in the fourth inning at Oriole Park at Camden Yards on June 28, 2013 in Baltimore, Maryland." With lots of strong competition covering the same events - and outlets, readers wanting live game action (or news) delivered quickly - we as photographers covering all types of events must send images frequently and often. In baseball, it's always a gamble running upstairs before the fourth inning to send some images of starting pitchers and any story telling images. There certainly have been times when all of the photographers covering the game are sending pictures at the same time when a huge play occurs. The other night during game one of a three game series, the Baltimore Orioles were having trouble hitting off of New York Yankees pitcher CC Sabathia. With the Yankees up, I thought it was safe to run up to transmit. I had the chance to tone and caption two pictures before I overheard the television in the photo room talking about a beautiful rainbow. I ran out to the press box, looked to the sky and confirmed it was indeed surreal. I grabbed my widest lens and worked the scene from the concourse. I knew anything higher wouldn't be as dramtic, and that the playing field level would be a tough frame to make in the short window the rainbow shined in the sky. Before I knew it, the rainbow was gone - just another clear sky night over Camden Yards. I love when things like this happen. For a couple minutes I was in a complete zen state - I didn't hear the crowd, I don't even know what happen in the game in that very brief time. But it was a scene that may never happen again at the ballpark and I was happy to be able to document it so others can remember the brief beauty in the sky.